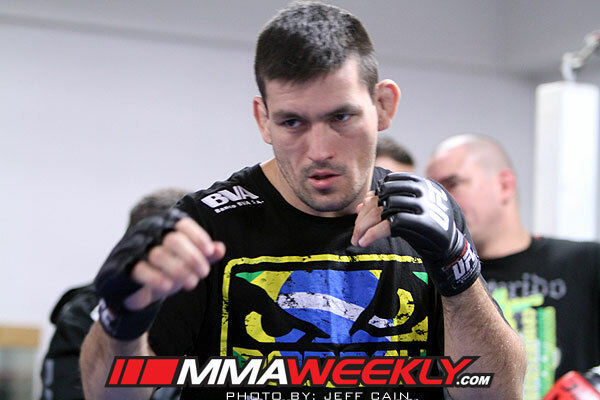 Two more fights have been added to the upcoming UFC 148 fight card on July 7, which now includes Demian Maia’s welterweight debut. The one time middleweight title challenger made the decision earlier this month to move to 170 pounds, and will now face Korean judoka Dong Hyun Kim at UFC 148. Maia most recently lost a close decision to late replacement Chris Weidman in their fight at the UFC on Fox 2 card in January. That put Maia’s record at 3-2 over his last five fights, but after battling in a weight class where the fighters were mostly larger than him, the Brazilian decided to make the move down to welterweight. He’ll have no easy task ahead, however, as he faces 6-1-1 UFC veteran Dong Hyun Kim. “Stun Gun” was on an undefeated streak in the UFC until he ran into current interim welterweight champion Carlos Condit last year at UFC 132. The Korean born fighter bounced back at UFC 141 with a dominant win over Sean Pierson. Also added to the UFC 148 card will be a middleweight scrap between Riki Fukuda and Matt Serra student Costa Philippou. Fukuda recently put on a solid performance defeating former WEC champ Steve Cantwell at UFC 144 in Japan, while Philippou continued to show his improvement with a win over former Ultimate Fighter season 11 winner Court McGee at UFC on FX 2. The win marked three in a row for Philippou, who has only lost once in the UFC. That lone loss was his Octagon debut that he took on short notice at UFC 128 last year. There’s been no word yet on whether the bouts featuring Maia vs. Kim or Philippou vs. Fukuda will make the main card or preliminary card for the evening’s show.